The Crowd Render Proxy allows to add Displacement on Entities geometry to add details at render time. As Redshift Displacement parameters can not be stored in the Character Geometry File (.fbx or .gcg), displacement information must be stored at the Character File level. Displacement Shaders are created automatically when a displaced mesh is imported to the character geometry mapping. 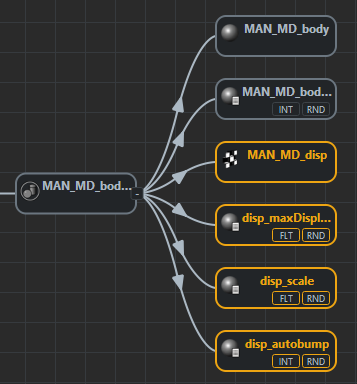 disp_maxDisplace float Maximum length the displacement shaders/textures will be displacing the vertices by (notice that this value can also be controlled with a ppAttribute). disp_scale float Scales the displacement results, which has the effect of accentuating or toning down the displacement (notice that this value can also be controlled with a ppAttribute). disp_autobump int Emulates what would happen if you were to tessellate your geometry to a sub-pixel level and modifies the surface normals accordingly, as if they were bump-mapped. (notice that this value can also be controlled with a ppAttribute). To work properly, the default Subdivision parameters of the Crowd Render Proxy should be changed as specified in Redshift User Guide.